I received my driving results from Progressive, AAA, and Safeco. I scored well on all except smooth driving. Smooth driving is very difficult if you do not drive many highway miles, but you can do well on distracted driving and between the hours of 12-4am. My view is it’s the wave of the future that will be soon build into all vehicles, and ride the wave to savings on your auto insurance. Please drive safe and wait to text until you are parked. I am trying both Safeco RightTrack and AAA Drive at the same time. They will monitor my driving including mobile distraction, time of day, and fatigue. I will post my results along the way, and any extra discounts. Frankfort, IL (March 15, 2016) – Safeco Insurance has recognized the Shanahan Insurance Agency Frankfort, IL with a Safeco® Premier Partner Program award for performance and partnership. Fewer than 10% of independent insurance agencies countrywide that sell Safeco personal lines products receive this distinguished honor. Only the best agencies are selected for the Safeco Premier Partner Program, which recognizes an agency’s success and its commitment to serve customers as a trusted advisor. Driverless cars have caught my attention the last few days with the auto show being in Chicago. The new Tesla is sharp in you got an extra $150,000 to spend on a car. Volvo also has some great cars for the near future. What are your thoughts on driverless cars? Do you think we are 10 years away from it being the norm, or is it much further down the road? With there being an earthquake reported in the northwest suburbs yesterday we thought this would be a good time to talk about earthquake insurance. While we are very glad to hear that there has been no damage or injuries reported due to this 2.9 magnitude earthquake, we think you should stay informed. Now, to the biggest question you might have for yourself, am I covered in the event of an earthquake? The answer is no. Unless you purchase a special rider on your policy that states that you do (and not all carriers provide this coverage). If you have any questions about earthquake insurance, or if it might be something you want to add to your policy, give us a call today at (815) 469-4545! Help Us Support Our Local Charities! At Shanahan Insurance, we care about our community. 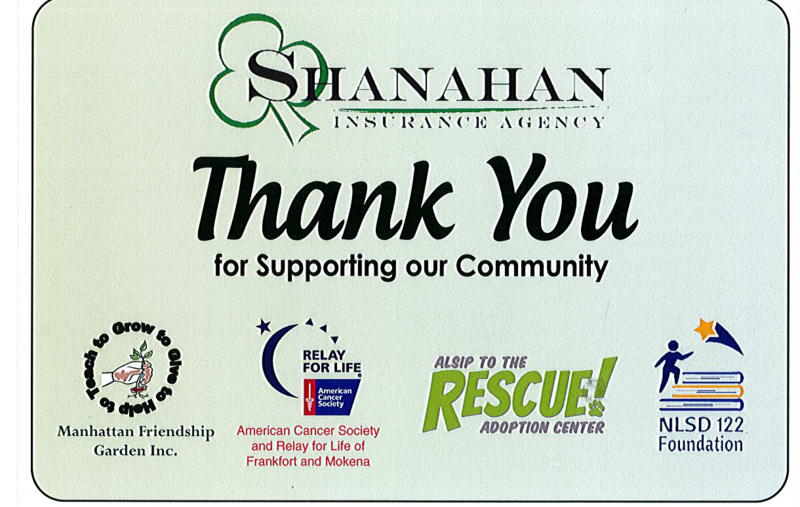 Every time that you refer someone to our agency, we will make a donation to one of our local charitable organizations. The Manhattan Friendship Garden Inc. is a group of volunteers who plant, weed, grow, and pick fresh vegetables that are sent to 28 different food pantries. The American Cancer Society and Relay for life of Mokena and Frankfort provides support, research, and donations to cancer patients in need. Alsip rescue adoption center aids animals in need of care. They help animals to find good homes. NSLD122 foundation of the New Lenox School District was established to raise funding through donations and provide enhanced educational opportunities for their students. So give us a call today to help your community and your wallet! Did you know over 2 million people tied the knot last year? December is the most popular month for weddings and engagements. Have you thought about a wedding protection plan? The average wedding cost is up to $30,000! Wedding insurance is so important when so much is being spent on creating the perfect day. The Wedding Protector Plan, from Travelers, is a no deductible policy starting at $160. This is a private event insurance which may protect against financial loss from unavoidable mishaps such as catastrophic weather, lost deposits, military development, bankrupt venues, ruined photos and more. It’s recommended clients purchase coverage as soon as they sign contracts and place deposits. However, policies can be issued up to 2 years in advance but it’s never too late! Give us a call at (815)469-4545 and we will work to give you the best benefits with your policy. Our friends at Servpro have come up with something great that we would love your help with! We will collect these stuffed animals at our office and pass them along so that they can be given to these children for this great cause! Please think about helping out a child in need today! We hope you had a great holiday with your families! We would like you to be as up to date as possible so here are a few roofing maintenance tips. The National Roofing Contractors Association recommends a home’s roof be inspected in the spring and fall to help spot potential problems early. We hope nothing but the best for you coming up this spring!